Happy Philippine Independence Day! As we've done every year since 2014, Rachel of Hello, Chelly & I are teaming up yet again to bring you Mabuhay! We take the opportunity every year to team up with Filipino authors, as well as highlight something we love about Pinoy culture. This year, we decided it would be fun to share an OPM playlist featuring some of our favorite tunes and spotlight a couple of authors that are new to us too! I spent majority of my formative years growing up in the Philippines, and OPM (original Pinoy music) was a part of my daily experience. Whether it was songs I heard on repeat on the radio, favorite karaoke tunes I picked up from my friends, traditional songs we learned for school performances, opening or closing songs for films and tv shows, my exposure to Pinoy music was certainly vast. I was really excited to put this playlist together for you guys (though it was also very difficult to narrow things down to just five songs, and I'm tempted to create another playlist for anyone else who is interested in OPM). Here are a few thoughts on the songs I chose, and I encourage you to go and visit Rachel's post to see her thoughts on her picks! Tagpuan by Moira de la Torre | This song is a newer one but I love it. It's essentially about a person who is praying for 'the one' after having gone through so much hurt and heartbreak, . It's a simple love song, but it just resonated so deeply with me the first time I heard it. Akap by Imago | I have always loved this particular song. The message cuts so deeply, as it's basically about being there through good and bad for the person that you love. It's about staying no matter how hard it gets. Huling Sayaw (Acoustic) by Kamikazee feat. Kyla | My brother-in-law Kahlil deserves the credit for introducing me to this particular song. It's a beautiful tune that captures the emotion of a fleeting, passing moment between lovers during a 'last dance'. It's so heartbreaking, but in the best way! Ligaw by Moonstar 88 feat. Chito Miranda | Of all the songs I picked for my portion of the playlist, this is the most upbeat! It's a song about getting to spend time with the person that you like and just getting caught up in that moment. Sana Maulit Muli by Gary Valenciano | There's a certain poignancy to this particular track (which is one that has been used on a soundtrack or two). It expresses the longing to return to the happiest moments of a relationship, as the singer seeks a chance at forgiveness. It always wrenches my heart to hear this one (and I had to feature Gary Valenciano, because his music was such a formative part of my childhood)! I'm so excited about the two authors that I'm featuring for this year's Q&A portion! (Side note: It is so cool for me to see more Filipino authors popping up both at home in the Philippines and abroad. And to read books that feature Filipino characters is also really exciting!) On my blog, I'll be sharing answers from authors Tif Marcelo and Marie Miranda Cruz, while Rachel has C.V. Wyk and Juleah del Rosario sharing their answers over on her blog. 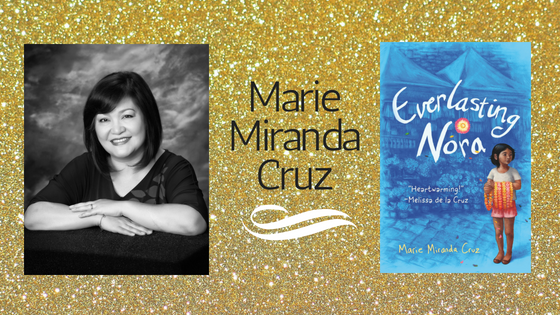 First up, I'm featuring debut author Marie Miranda Cruz. Her middle grade novel Everlasting Nora is out in October of this year (and I'm so excited to read it). From her own author bio: "I am a writer of middle grade and young adult novels, a scientist, a proud mother of two grown up kids and the wife of a Jedi Knight. I love to knit and crochet fingerless gloves." Alexa: What aspects of Filipino culture would you like to see more of in the books you read? MMC: I’ve always been fascinated with Filipino mysticism. It's a practice that has become part of many Filipino lives. When I was growing up in the Philippines, my relatives would go to a manghihilot for treatment of pain or to a mangtatawas to find out what caused a sudden fever (this is done by pouring melted wax into a basin of water and the shapes formed would reveal if the fever was caused by a person casting an evil eye or an elemental being like the dwende.) These practices are intertwined with spiritualism. I have included these aspects in books I've written and I hope to share them with my readers someday. Another aspect I love is Filipino folklore. I would love to read a book that incorporated this mythos. I'd also love to see more books with Filipino main characters who solve mysteries and investigate crimes. Representation is so important in all genres of literature! Alexa: Ooh, I would definitely want to read more stories inspired by Filipino folklore! That would be so, so fun. Okay, last question, what Filipino book would you recommend? MMC: Since I have been reading and writing books with Filipino characters I would like to recommend THE HOUSE THAT LOU BUILT by Mae Respicio, releasing on June 12. It's a lovely story, one that will resonate with many readers from 8 to 88. I wish I had this book when I was growing up. 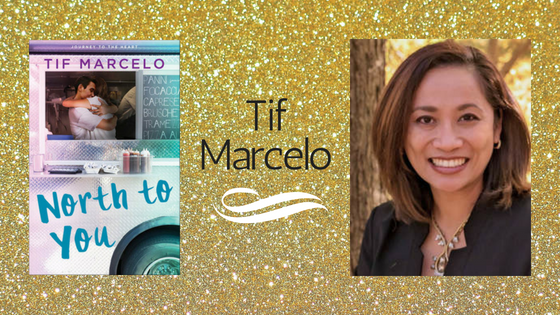 Second, I'm honored to feature Tif Marcelo. Tif is the author of the Journey to the Heart series (North to You, East in Paradise and West Coast Love), as well as the upcoming The Key to Happily Ever After. (Alexa's Note: I've read North to You, and it was delightful! Cannot wait to read the other books!) From her own author bio: "Tif believes in and writes about heart-eyes romance, the strength of families, and the endurance of friendship. A veteran Army Nurse with a Bachelor of Science in Nursing and a Master of Public Administration, she is a craft enthusiast, food-lover and the occasional half-marathon runner. As a military spouse, she has moved nine times, and this adventure shows in some of her free-spirited characters. Tif currently lives in the DC area with her own real life military hero and four children." TM: Simply put: I would love to see more books with Filipino diaspora in American adult commercial fiction! I'd like to see books about identity with primary FilipinoX characters and the gamut of secondary and tertiary characters who encompass all of our walks of life. I'd like to see Filipinos from the Philippines, expats, Fil-Am, biracial, multiracial, creatives, billionaires, athletes, scientists, and rockstars in all the tropes. I want to see our people fall in love on the page, get their hearts broken, reunite with their loves, and participate in a mastermind plot to save the world and they are the hero/heroine. Is that too much to ask for? *winks* Honestly, I don't want to ask for less than that, in hopes we achieve even a portion of it. I grew up not reading us on the page, but I'm thrilled that our Filipino middle grade and young adults have authors to look to such as Erin Entrada Kelly, Melissa de la Cruz, Randy Ribay, and more. And with a growing list of FilipinoX authors in adult fiction such as Mia Alvar, Mia Hopkins, Maida Malby, Jennifer Hillier, Mina Esguerra, and Roselle Lim, I'm hopeful that these children will have a nice list of books to read when they become adults. But, as I like to say: more, we need more! Alexa: I definitely agree! As a Filipino, what do you find special or inspirational about our culture? Alexa: The Filipino community is such a wonderful thing to be a part of! Especially if you're far away from home (like me). I'm so glad that it's a big part of your life too. Okay, last question, what Filipino book would you recommend? TM: At the moment, I'm really crushing on Mia Alvar's IN THE COUNTRY. It's a collection of short stories that depict Filipino diaspora. I'm halfway through the book and I just love it. She cuts right to the heart of emotion, down to the nitty gritty of intention. I highly recommend it! I really hope you enjoyed this year's posts for Mabuhay! If you're interested in seeing what else we've done for Mabuhay! in the past, I've linked to all our previous posts below. I love learning more about where you grew up and lived for so long :D Thank you for sharing about all of this lovely. <3 The music seems amazing.